Proximal hamstring tendinopathy (PHT) is a condition that affects the hamstring muscles in the back of the thighs. PHT is particularly common in runners and triathletes, and typically causes pain in the buttocks while running or after sitting for long periods of time. Not much literature exists on treatment for PHT, and most available research revolves around surgery; however, several non-surgical options have also been described. Eccentric strengthening, which includes exercises that lengthens muscles while strengthening them, is currently the most commonly accepted therapeutic exercise approach for tendinopathy. To get a better sense of how effective these exercises are for PHT, an individualized study called a case report was conducted on one patient with the condition. A 34-year old healthy man who had been participating in triathletes for 14 years was selected. He experienced pain in his right buttock that became worse after sitting on hard surfaces for extended periods and running, and it did not improve with over-the-counter pain medications. After completing an evaluation of this patient, researchers created a detailed intervention. He was asked to stop running and was initially treated with a combination of weight-bearing and non-weight-bearing eccentric exercises, which he was instructed to perform to the point of reproducing his normal pain. This program lasted four weeks, and after its completion, he had only slightly improved in his symptoms. 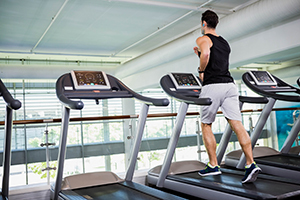 Since the patient did not improve much, researchers devised a new program of eccentric hamstring strengthening exercises to be performed on a treadmill. While performing these exercises, the patient was instructed to provide enough resistance to reproduce his typical pain to a moderate level and make sure the pain did not get worse. After two weeks, the pain began to decrease and he was able to perform them at a higher intensity level. By four weeks, he was able to resume running at a gradual rate, increasing his mileage by 0.5 miles each week. Finally, at 12 weeks he had completely resolved his symptoms and returned to full activities. This study shows that runners with PHT can benefit from eccentric strengthening that uses a treadmill and practitioners should therefore consider implementing such a program when treating these patients.